Yes, our Grape Balm is icky and ugly, but highly effective and especially effective for any skin issue that is already ugly and icky! 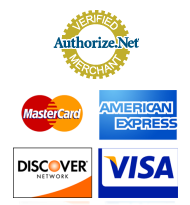 And the same great product and same great ingredients and formulation that I perfected years ago has now been perfected even more with a process that creates a easier-to-apply and lower odor end product for you to use and provide. You've always loved it before and you'll love it now! Contains Grape Seed Extract, Clove Oil, Walnut, Pau D’ Arco, Garlic and Artemisia and NO chemicals! 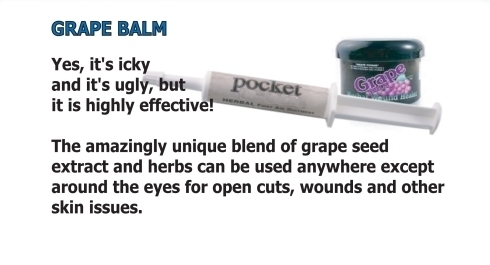 Grape Balm has been a favorite for years for those "yikes, when did that happen" cuts, wounds etc. You can use literally anywhere on the skin except the eyes. It too, comes in two sizes... both a jar and a tube. The jar is great for large surface area locations like warts or fungal issues. The tube version is great for "flushing" those icky abscesses. I just can't list all the uses that people have found for Grape Balm over the more than 10 years that it has been on the market. You will be amazed! "It's easy to get over the smell... because there is nothing else like it!" (Pocket Size 6-Pack) $12.00 Savings !